I put a question mark at the end…because is it really the end of summer? I mean, I guess traditionally, Labor Day weekend is the ‘official’ end of summer. And that’s less than 2 weeks away. But kids are back to school already; especially everywhere but California, but even here, they are going back earlier and earlier. And/but, here in California, our two hottest months are August and September. We have warm weather through to the week of Halloween. We don’t need even a sweater before Halloween week. Leaves don’t start to change colors (the few varieties that DO change colors-most don’t) here until November or even early December. But Pumpkin Spice Latte (and my favorite, Salted Caramel Mocha) are returning to Starbucks within 10 days. Football is back. New ‘fall’ TV programming starts in less than a month. But the calendar tells us the official end of summer is September 22nd. 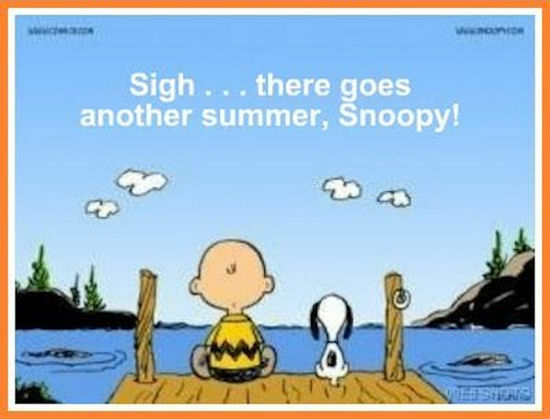 So, when does summer really end? I bet we all have different opinions. And I’d love to hear yours!! This entry was posted in Uncategorized on August 21, 2018 by Silver Willow. Yes, September and August are our 2 hottest months. My first marriage was on 9/30, and it was over 100 degrees. yes, we are weather babies here in Southern California. No denying it. But dayum, do we PAY, literally, for it! thanks, Laurie! Our summers are very long here, weather-wise. Well into October.